The Hamsa symbolizes the Hand of God, and, regardless of the faith that uses it, is considered a protective sign bringing it's owner happiness, luck, health, and good fortune. Overall Size, approx. 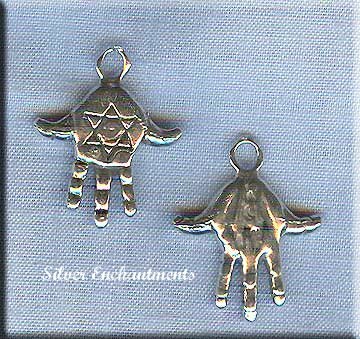 : 19mm x 15mm x 3mm = ~3/4+" x 5/8"
More About the Hamsa - The hamsa is a palm-shaped amulet popular throughout the Middle East and North Africa, and commonly used in jewelry and wall hangings. Depicting the open right hand, an image recognized and used as a sign of protection in many societies throughout history, the hamsa provides superstitious defense against the evil eye. It is also known as the Hand of Fatima, the Hand of Mary (for the mother of Jesus), and/or the hand of Miriam (for Miriam, sister of Moses).